Instructions: Prepare a white card base 5 x 7". Trim a piece of the Burst of Spring paper 3 1/2 x 5 1/2" and adhere to the center of the card. Die cut one of the Intricate Swirl fames out of white cardstock. Add tiny foam dots to the back and adhere to card. 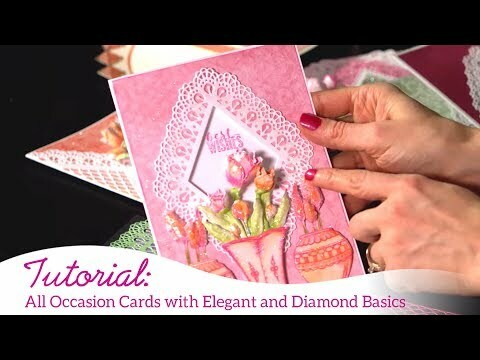 Die cut the Lacy Diamond out of white cardstock, add the foam strips to the back and adhere to the card as shown. Stamp the leaves and flowers on white cardstock with the black ink. Color the leaves with the Leaf Green ink, cut out with the coordinating die, ink up the edges with the Library Green ink. Color the flowers with the Sunflowers ink in the center, lightly color the outer with the deep purple and cut out with the coordinating die, ink up the edges with the Deep Purple. Place all the leaves and flowers in the mold and run through the die cutting machine. Assemble the flowers. Place the leaves in both the upper right hand corner and lower left hand corner. Add the flowers on top of the leaves. Add glitter to all the leaves and flowers. Add Prills to the center of each flower. Stamp the sentiment on white with the black ink, cut out using the Arrows and Banner die, ink up the edge with the Deep Purple, add tiny foam dots to the back and adhere to the card.